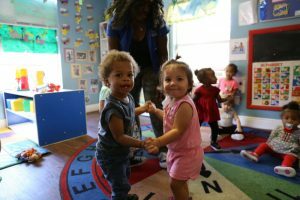 At Children’s Academy Brandon, we know how important the early years are in a child’s development. Our infant and toddler caregivers are actually “educators”, as they carefully blend the responsibility of providing the highest quality care and security to your child, while at the same time offering your child a wealth of learning experiences through everyday activities. Plenty for Toddlers to do here! The keystone in our high quality program is a curriculum that is specifically designed for children from birth to two years old. Our educators design daily routines that focus on supporting and nurturing the developmental stages that each individual child is experiencing. 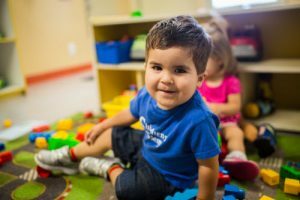 When you look in our infant rooms, you might see a caregiver playing “peek-a-boo” with a four month old, reciting a nursery rhyme to a toddler as she changes a diaper, or talking about nature to a group of 1 year olds while taking them on a buggy ride. Each of these simple, loving, everyday experiences has a profound effect on a young child’s development. Just a food nourishes the body, these experiences nourish your child’s brain. Your toddler’s language is exploding as he uses both meaningful words and gestures to communicate his feelings and ideas to you, his teachers and to other toddlers. Language experiences in the first two years of life lay the foundation for cognitive though and reading skills so our thoughtful teachers will not only always encourage your toddler’s efforts to communicate but will also make communicating with them a regular and very important part of each and every experience. Making Friends Is Part Of The Fun! As your toddler learns more about himself and his abilities, he also becomes aware of others. We will provide daily opportunities for group experiences where songs, fingerplay, movement activities and stories are introduced. We will be there to nurture and guide him as his first friendships develop. Your toddler’s eagerness to be independent will make practicing self-help skills like hand washing, picking up and putting away toys, putting on a coat and sharing with others exciting and fun. Your youngster will be so proud of himself as he learns to master many of these important milestones under the careful guidance of our skilled teachers. For your active toddler, movement is more than just a way of getting from one place to another; it’s actually a way of learning. Toddlers who are able to use their bodies to accomplish tasks and influence their environment feel a great sense of pride. Our music and movement program will challenge your youngster with a myriad of physical activities and will surely aid in his motor development.